Choose native vegetation. Purple poppy mallow is a native Missouri perennial which thrives well locally. Apart from being a hardy flower, it requires little water therefore reducing your watering cycle and conserves water. Consider our 2 wire sprinkler system. Our intelligent sprinkler system with evapo transpiration sensitivity can detect when water moisture in the soil reduces and turn on automatically below a set threshold therefore minimizing your irrigation water usage. Mulch your flower beds and kitchen garden. Utilize the dead grass and foliage smartly by spreading it around your vegetable and flower stems. This helps retain moisture in the soil longer and reduces the frequency with which you need to water your plants. 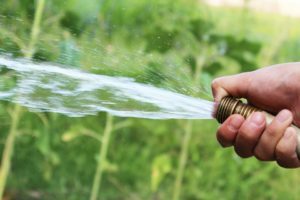 Planning around the vegetation and watering systems in your home are an essential economical and environmental friendly way to utilize and conserve water. We at Hermes Landscaping can help you plan your garden and converse water. Please contact us, we will be glad to assist!